Tharg's Future Shocks are one-off, twist ending, sci-fi thrills that have introduced many of the biggest names in the comic book industry through the pages of 2000 AD. THE ULTIMATE VISION OF THE FUTURE! 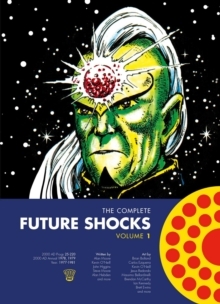 From Alan Moore to Al Ewing, Kevin O'Neill to Jon Davis-Hunt, Future Shocks have been a staple of the UK's best-selling comic 2000 AD!